The Ninth US - China CEO and Former Senior Officials’ Dialogue was Held from June 20 to 21 in Beijing. Delegates from China and the US had candid discussions on the new path of the bilateral economic and trade relations after the summit between President Xi Jinping and President Donald trump at Mar-a-Lago in April 2017, covering the “100-Day Plan”, infrastructure, bilateral investment, industrial cooperation and digital economy. Zeng Peiyan, Chairman of CCIEE, and 34 Chinese and U.S. delegates participated in the dialogue, including CEOs, former senior officials and scholars. Chinese participants expressed that world economy has experienced moderate recovery and social ideology has undergone profound development since last year. Currently, the problem of global politics is greater than the economic problem, which has brought a lot of uncertainties to future development. To address the China-US relations properly is not only vital for the two countries but also have a significant impact on world's development and stability. The two presidents' meeting at Mar-a-Lago in April has enabled them to establish a sound working relationship and personal friendship, which will help to stabilize China-US relations, ease worries and enhance positive expectation for the future. Both China and the US have a good version of development. President Xi proposed to realize the China Dream of rejuvenating China, while President Trump's slogan is "make America great again". Hopefully, the two "great" can complement and connect with each other, so as to create a great era which will benefit the world by joint effort. As can be seen in the “100 Day Plan” for China-US economic cooperation, the two countries showed strong willingness to cooperate in such fields as agricultural trade, financial service and so forth. Furthermore, they have made progress in investment and infrastructure, which is a good start. China-US relations is the most important and complicated relations in the world, therefore, the 100 days of negotiation will not be able to resolve all the problems. The question of how to advance the China-US economic and trade relations will test the wisdom of the two sides. Taking all these factors into account, China and the US should be honest with each other, promote pragmatic cooperation and take the path of common development. The US delegates noted that China and the US have strong complementarities in economic and trade cooperation. The further expansion of bilateral economic and trade cooperation will benefit both countries and ensure the stable economic growth of world economy. The business community in the US will continue to promote cooperation in trade, investment and other areas to foster healthy development of bilateral trade and economic relations. The participants from both sides also conducted in-depth exchanges on Trump administration’s foreign trade and economic policies, China-US trade deficit and other issues. At the end of the dialogue, CCIEE and USCC released a joint statement, calling on the Chinese and US leaders to further liberalize domestic economies and provide more support for creating a fair and free environment for global trade and investment. In particular, they should enlarge the mutually beneficial and win-win China-US economic and trade relations to benefit the business communities and people of the two countries. Apart from that, they should facilitate trade and investment in the fields of high-tech, internet economy, manufacturing, financial services, oil and gas cooperation, energy commodities trade, environmentally friendly technology, sustainable construction of infrastructure and healthcare. Both sides agreed that China-US relations should be handled with a strategic perspective and cooperation, rather than disagreement, should lead the most important relations in the 21st century. Both sides suggested that effective measures should be implemented to promote trade and investment, strengthen the multilateral trading system, push forward market-based financial reform, foster industrial innovation, digital economy and cyber security, and enhance cooperation on energy and environment. The two sides decided to carry out various events such as sharing their successful experience in financial services, information and communication technology, to strengthen investment and trade either under the framework of the Belt and Road or through other forms, promote the development of digital economy and trade, and ultimately ensure a healthy development of the China-US relations. 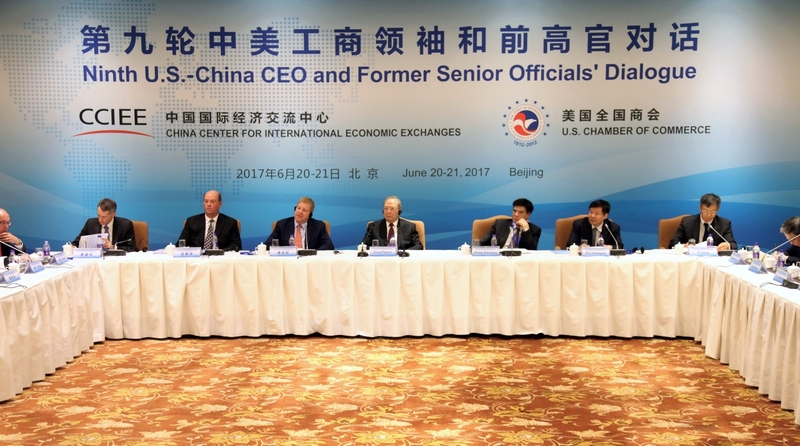 The China-US CEO and Former Senior Officials Dialogue is co-hosted by CCIEE and the US Chamber of Commerce, with the aim of creating a platform for exchange between the US and China’s business leaders, former senior officials and scholars. Therefore, it is referred to the “second track” communication channel. So far, nine rounds of dialogue have been held in Beijing and Washington on a rota basis.